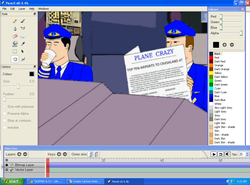 In the old days the process of cartoon animation seemed tedious to many, but now there is cartoon animation software, and some of it is free. No longer do you need to use physical transparencies and individual drawings on paper in order to animate a cartoon. Some of the software available today can even fill in all the frames in between two separate drawings, virtually animating for you. With some animation software like Toon Boom Studio you can create a skeleton (bones) for your cartoon figure, making it possible to move individual parts instead of redrawing. There is animation software for any budget, and some of it is free. One such free (open source) program is called Pencil 0.4.4b. Here we describe its features. Click on the Pencil Website and you can get started. After you have downloaded the particular program for your operating system, read the user manual on the website. When it is installed, you will notice that the user interface is quite simple, there is the drawing area in the middle, a menu bar on top, a toolbox on the left, and colour toolbox on the right. The business end of the program, however, is along the bottom. Here is where you’ll find the timeline, and to the left of it the different layers. There are plus and minus buttons on both the layers section and the timeline section. By clicking on the plus button in the layer section you can add a layer. Think of each layer as a separate transparent sheet that you can draw on. The first layer is the one underneath all the others. On a bitmap layer you can draw, and import a bitmap image which you could use as your background, for example. A vector layer is a different animal. When you draw on a vector layer, it remembers your drawing as a set of equations. This means that you can manipulate your drawing afterwards, changing the shape of a line, for example. You can also zoom in on a vector layer and the drawing remains sharp, it doesn’t “pixelise”, so to speak. Each layer extends into the timeline section; above this there is another set of plus and minus buttons. Now just click on the layer you are working on, at the point in the timeline where you want a new frame, and click on the plus button and a rectangle appears; then start drawing, this is where your current drawing will appear. That frame (key frame) will be repeated until you add another on that layer. So in your background layer you could import an image on the first frame and it will remain there for as long as you want it as your background. On the left side of each layer there is a circle, it can be white, grey, or black. This indicates whether that layer is invisible, semi-transparent or solid; this is useful when aligning various layers. Just click on a circle to change its transparency. Above the layers is a master circle that can change the transparency of all the layers at the same time. There are two onion skin buttons, and by clicking on them you can see the previous or next frame semi-transparently on the current layer. Remember this is a program in development, so there are a few glitches. Save your work frequently; the program may sometimes crash, especially when bucket filling objects in a vector layer. To change the thickness of the line drawn with a drawing tool, you may have to click on the slider button more than once. The export file formats are somewhat limited, so I use a screen capture program which is also free, called “camstudio”, this allows me to convert my animation into an AVI video file. In conclusion, I hope you have as much fun as I have had in bringing my ideas to life. How cool my daughter is so going to love this, tweeting it now. Just who and what are fueling the continuing "Sherlock" craze? Here we find out.